The Current Health Scenario. : Medicine is up for sale, says reputed Nephrologist. Medicine is up for sale, says reputed Nephrologist. One of the greatest problems in medicine today is that academic medicine has been sold to the highest bidder. Under the guise of ‘Evidence Based Medicine’ the public has been sold fraudulent goods, and the result is that people suffer from unnecessary but lucrative procedures and take unnecessary but lucrative medications. Let me explain. Much of the data we use in medicine comes from epidemiology studies — where one thing is associated with another. It is easy to prove association, but much harder to prove that one thing causes the other, which is what we want to know. It is very dangerous to accept data from epidemiologic studies because there are too many confounding factors. That is how we wound up with millions of women prescribed hormone replacement therapy (HRT), which turned out to be giving them cancer. In the late 1990s, there was a very strong association between women taking HRT and reduction of heart disease — about a 50% reduction. Based on this flimsy evidence, millions of women were prescribed the drug. It turns out, that when the trials were finally completed a decade or so later, that HRT did NOT reduce heart disease at all. Instead, women who took HRT were also healthier in many other ways — and these confounding factors accounted for the apparent heart disease risk reduction. It further turns out that HRT was giving women breast cancer. 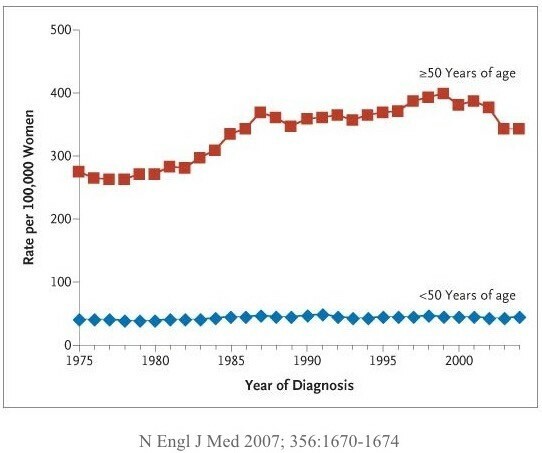 When prescribing of HRT increased through the 1980s and 1990s, breast cancer also increased. But tellingly, when HRT decreased around year 2000, breast cancer also decreased by 6.7%. 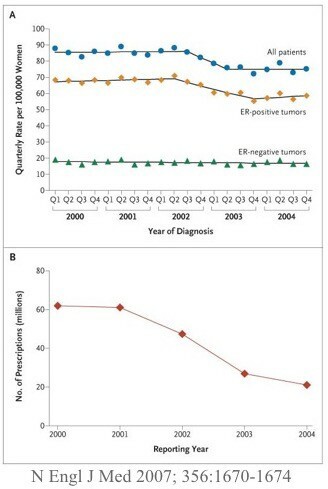 Almost nothing in medicine causes this type of sustained decrease in cancer, and the implication is that HRT caused cancer in millions of women. The worst part is that it was the DOCTORS that caused all these cancers, by widely prescribing a lucrative medication based only on flimsy evidence and lots of encouragement by drug companies. The problem is not the drug company, which will always do whatever it can do push its drugs. The companies duty is to make money for shareholders, not to safeguard the public. The problem is that the doctors and the universities have financial conflicts of interest by taking millions of $$$ from these companies. The duty of doctors and universities is to guard the public health and to scientific truth — which is much harder when all your funding comes from companies that have vested interests in proving benefits. Doctors and universities, and everybody else in the world knows that you don’t bite the hand that feeds you. The New York Times reported on the recent CABANA trialof catheter ablation for atrial fibrillation. Once again, a highly invasive but lucrative procedure became widespread based on no evidence at all. But wide promotion by device companies led many doctors to inflict this on unknowing but trusting patients. How are we to protect against this? This is where evidence based medicine is supposed to shine, but demanding randomized trials to prove that certain procedures/ drugs either work or don’t. Great, right? Well, not so much. The problem is when all of these trials are paid for by industry, then the evidence is severely biased. If the evidence base is biased, then evidence based medicine is completely worthless. It’s one thing to say that Harvard researcher prove that XYZ drug cures cancer. We might believe this. But, it’s another thing to say that XYZ drug maker proves that their drug cures cancer. In this case, almost none of us believe it. The solution, if you are XYZ drug maker? Simple. Pay Harvard researchers millions of $$$ to do a study, but bias it so severely that it is a virtual certainty that XYZ drug looks like it works. Then claim that it was the Harvard researcher who proved XYZ drug cures cancer. It’s a win-win-win situation. XYZ drug maker is happy to have ‘evidence’ that ‘proves’ their drug works. Harvard is happy with all the $$$. Researcher is happy with all the $$$ and the prestige of ‘proving’ the drug works. It actually matters almost not at all if the drug actually works or not. It’s fantastically easy to design a trial and rig the results as we’ll soon see. The only loser? Public health — it spends money on useless or dangerous medications and people die. No biggie for the universities and doctors lining their pockets. 26 of the articles found there was no association, and 34 found a positive association — ie. that sugar was linked to obesity. Pretty close, right? 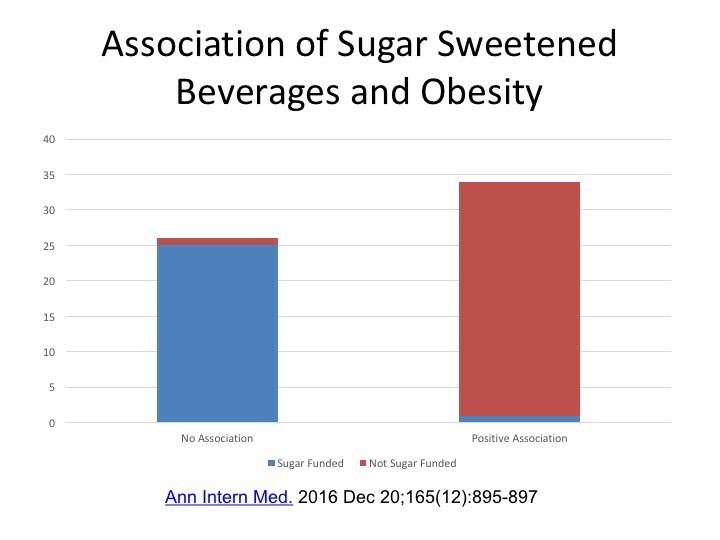 If you didn’t know about conflicts of interest, then you would think that it’s equivocal whether sugar causes obesity or not. What if we were to show which papers were funded by the sugar industry? This is what you find. 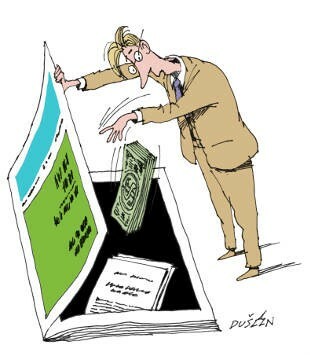 25 of the 26 (96.2%) papers showing that sugar is NOT linked to obesity were funded by the sugar industry! When you look at the papers that suggested sugar WAS linked to obesity, only 1 of the 34 (2.9%) was funded by the sugar industry. The ‘scientific’ result was based almost entirely on who pays the researchers. University professors and doctors have sold their scientific opinions and integrity to the highest bidder. For example, researchers at the University of Toronto, like Dr. John Sievenpiper are regularly trotted out in the national media saying that sugar is practically a health food. It turns out that his group receives millions of $$$to have this opinion. It sure sounds a lot better to say that ‘Doctors at the University of Toronto say sugar not linked to obesity’ that ‘Sugar company research shows that sugar not linked to obesity’. The same goes for medications. Dr. Aseem Malhotra, a UK cardiologist made headlineswriting a paper describing one of the most insidious problems in modern medicine — too much prescription medicine, driven mainly by biased research. Statin medications are one of the most lucrative drug classes of the last 20 years. But almost all trials of these medications have been funded extensively by the companies themselves. Problem? It’s an open secret that doctors and universities are paid millions of $$$ to perform these trials, which then show that statins are the best thing since sliced bread. These financial conflicts of interest are not merely academic musings. People die. Take the opioid crisis for example. Drug companies paid lots of money to doctors to prescribe opioids. People got addicted, and many died. CNN showedthat a group of doctors who received over $10,000 from the opioid company prescribed $1.2 million worth of drugs, compared to doctors who received less than $20 from drug companies prescribed only $34,000.